In Hinduism, religion (dharma) influences the way people live and view themselves. The very act of living is regarded as an obligatory duty and an opportunity to fulfill the aims of creation and participate in God’s eternal dharma. Tradition holds that religious duty (dharma) is the primary aim (Purusharthas) of human life since it is the foundation upon which one develops the wisdom and discretion to pursue wealth (artha) and happiness (kama) without compromising the chances liberation (moksha). From the Book, Introduction to Hinduism by Jayaram V.
Hinduism is not a religion but a way of life. It is very difficult to separate living and religion in Hinduism. In this article we try to understand the philosophy hidden behind this beautiful and noble concept of human life. While many people know that Hinduism is a way of life, but do not know clearly why it is so. In this essay we have given ten reasons why Hinduism is considered a way of life rather than a religion. 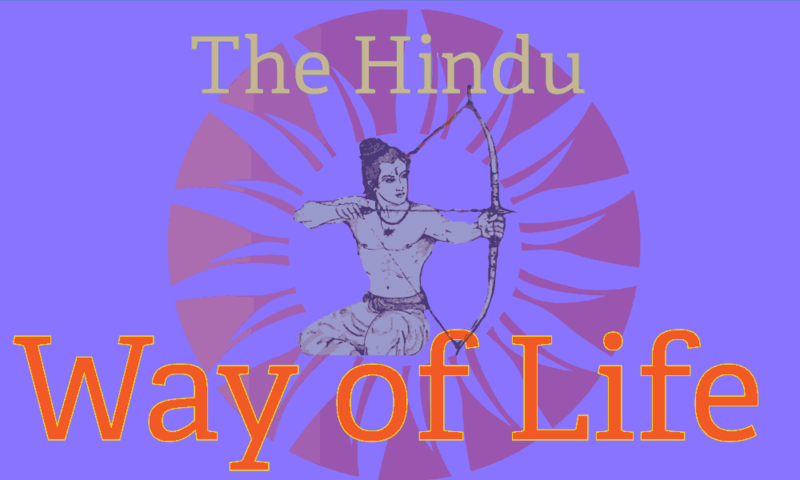 What do we mean when we say Hinduism is a way of life? How is it different from other religions? Find out. Hindus believe in not only one supreme Universal Self, but in many gods and goddesses whom they venerate in every possible way. Many do not know why Hinduism does not discourage polytheism and worship of many gods and goddesses. Read this article for more information. Caste System has been the bane of Hindu society for centuries. In terms of impact, it did much greater damage for a much longer period to a great many people than the slave system of the western world or the witch-hunting practices of medieval Europe. In Hinduism Brahman is not a mere static or passive Being. He is also both Being and Non-Being. As Being, he assumes various forms and roles in order to maintain the process of creation. Read this article to understand the various aspects of Brahman in detail. The Hindu concept of evolution is far superior in its approach and scope to the concept known in the scientific circles. Science deals with the physical aspects of human evolution while Hindu scriptures go beyond this and explain the metaphysical evolution of man. Links to many sites on Hindu way of life are available from here. Truly Brahman of Hinduism represents the Highest principle which the human mind can ever conceive of. In Hinduism Brahman is not God of just one world or a few worlds, but represents the entire known and unknown Universes as well as the past, the present and the future that is yet to come. There is a misconception among many that Hinduism is a fatalistic religion because of its emphasis on the theory of karma. This is far from the truth. According to Hinduism man is a master of his own fate. To know how this is so, read this article on karma. Hindus believe that the soul passes through many births and deaths before attaining final freedom from mortality. Read this article for more information on the concept of reincarnation of soul according to Hinduism. The devotional aspects of Hinduism are more visible and popular. The Hindu scriptures are replete with numerous examples of pure devotion and how it is expressed through prayers and supplications. You will find here Hindu prayers and invocations which are addressed to popular gods and goddesses of Hinduism and used by devout Hindus during worship. Hindus worship many idols assuming them to be the forms of God. Idol worship is not a mere superstitious or obscurantist practice. A lot of symbolic significance is hidden behind this form of divine worship. This concept is elaborated in this article. If Hinduism survived centuries of oppression in the hands of foreign powers who practiced different religions and emerged as a religion of great spiritual depth and vitality, it is because of the contribution made by thousands of ascetics, gurus, babas, yogis, munis and sanyasis in their individual capacities. Hindus believe in the existence of eternal soul which is the Universal self in its microcosmic aspect. The concept of soul known to Hindus is entirely different from the concept known to the western religions. To understand more about this please read this article. A huge resource base of translations of many ancient scriptures of Hinduism, Buddhism and other eastern religions.